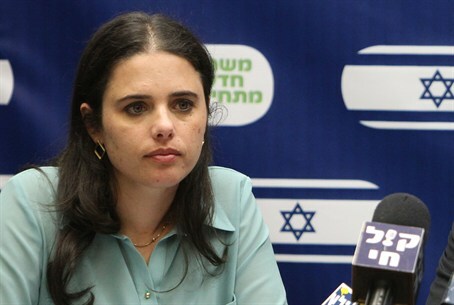 MK Ayelet Shaked (Jewish Home) dispatched a letter to Knesset members and ambassadors in Israel Sunday, following reports of violent and anti-Semitic content featured on the Gaza radio station "Sawt Al-Quds", broadcasted on FM 102.7. The program, named "Arva Vanet" (lit. "no homeland"), airs several times a week and profiles a "martyr" for the "Palestinian people," according to the letter. The program glorifies that murder of civilians - especially Religious Zionists. Each story details a different terror attack and is accompanied by a soundtrack full of pathos. The show airs in the afternoon and evening - a prime time to reach the ears of children and teenagers returning home from school. Shaked gives one example of programming by the station, citing an episode which aired on January 1. "The broadcaster talked about the "martyr" from the city of Nablus, born in 1977, who blew himself up in Netanya, killing large numbers of Jews 'by the Grace of G-d,'" she stated. Shaked responded, "We are trying to make peace with these people? They incite to murder and praise terrorist atrocities! They educate their children to murder innocent people! They have no regard for morals or human life!" Shaked noted that Prime Minister Binyamin Netanyahu promised peace only in the event that incitement against Jews and Israeli stopped. Now that the incitement continues, "why do we continue the deception [of negotiations]? Why do we stand blind to reality?" she asked. Israel's Security Agency (ISA or the Shin Bet) statistics in 2013 revealed that terror attacks have been on the rise since peace talks resumed. Prime Minister Binyamin Netanyahu remarked Friday that incitement - not just from the Hamas, but from the PA as well - is "a major factor behind the attacks."